This dayglow orange traffic cone has two silver reflective collars that are designed for high visibility in daylight or night working hours. SKU: LS-TC186TF Category: Traffic Cones Tags: orange traffic cone, reflective traffic cone, silver reflective, traffic cone Brands: TruForce. This dayglow orange colored traffic cone from TruForce has two silver reflective bands, one 4-inch and one 6-inch band. The double reflective collars make this traffic much more visible, especially at night, when traffic cones can often become much less visible, which can make traffic control situations much more dangerous. 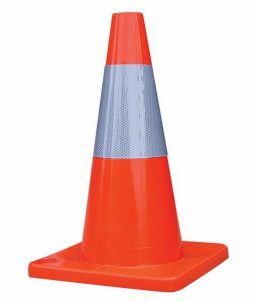 This reflective traffic cone is made of PVC, which gives it superior flexibility in both hot and cold weather. The cone is designed to bounce back after being crushed. 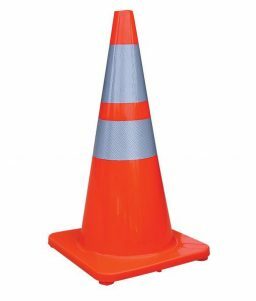 The wide body keeps these traffic cones stable and upright even when bumped. 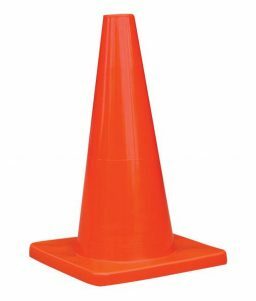 This traffic cone is 28 inches tall and weighs 4.5 pounds. 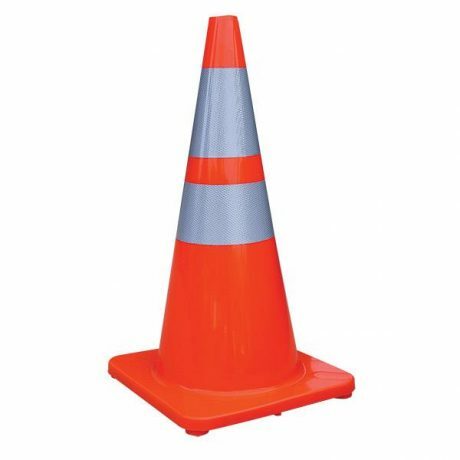 In addition to the silver reflective color used for higher visibility, the rest of the cone is colored dayglow orange, which helps with daytime visibility.